You know it was a great book when, after you finished it days ago, you find yourself still thinking about it. I'm at a loss for words. It has been ages since a book has affected me like this emotionally. I've got no flowery language, no qualms, nothing. All I really have to say is wow. Educated is the memoir of Tara Westover, who didn't step foot into a classroom until she was seventeen. Born to survivalist Morman parents in the mountains of Idaho, she grew up preparing for the end days by sleeping with a "head for the hills" bag and spending summers canning anything they could. Her father forbade hospitals, so Tara never saw a nurse or a doctor. Serious injuries were treated at home by her mother, a self-taught midwife and herbalist. And because they were so isolated from anyone, there was no one to intervene when one of her older brothers became violent or when her father became even more extreme in his beliefs. Then, lacking any formal education, Tara began to teach herself math and grammar. Which lead her to being admitted to Brigham Young University in Utah, then to Cambridge, then to Harvard, and then back to Cambridge to receive a PhD in History. It's amazing. I can't tell you how many times this story made my jaw drop. Everything about this story is shocking; how her parents could ignore the abuse that was happening under their roof, for one example, is beyond me. And then go so far as to disown Tara instead of dealing with their son is appalling. Author Claire Dederer says this about Tara's memoir and it explains how I felt so well: "A punch to the gut, a slow burn, a savage indictment, a love letter.... Rarely have I read a book that made me so uncomfortable, so enraged, and at the same time to utterly entirely absorbed. I loved this book, and this woman". The way Tara writes her story, I think, is what I loved the most. For someone who has literally gone through hell, she doesn't write about her experience in a bitter tone at all. Being so isolated as her family was, there was nobody around long enough to tell her what was happening wasn't even close to being okay, and that's how she writes. She didn't know any different. How could she have? And it doesn't end happy either. To this day, her parents still won't see her. And of her seven siblings, she's close to three. My goal this year is to read more non-fiction. And to be honest, I'm a little upset that this was the first book that I've read not only this year, but within my goal, because I honestly don't know how anything I'm going to read now is going to top it. This book was that good. 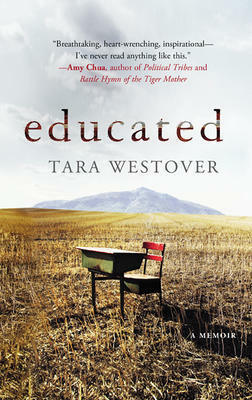 For more information on Educated by Tara Westover, visit us in store or visit our website here.